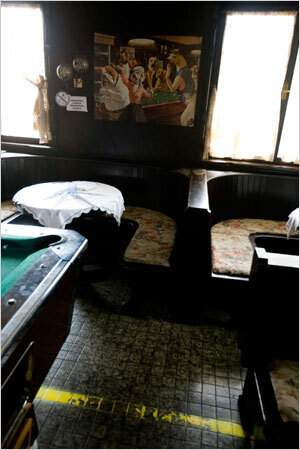 This is a picture of the inside of a tavern that sits on the border of Croatia and Slovenia. Literally on the border — the far side of the yellow line is Slovenia, the near side Croatia. It is an interesting article about how those crazy Balkans still can’t give it a rest, with Slovenian nationalists trying to scuttle Croatia’s plans of joining NATO. The title is not “Despite Feud, Croats and Slovenes United by Humorous Painting of Dogs Playing Pool.” That’s a shame –the Croats and Slovenes in the story are not united at all, and the painting (“Scratched at Dawn” by Arthur Sarnoff) doesn’t even get a mention.